Most of the people are moving towards other devices like iPad, iPhone, tablet, etc. for accessing device rather than accessing from computer. So, it becomes must for webmaster to adopt responsive design for their website to catch more visitors from various destinations. Magento Mobile interface HTML5 Theme is free Magento theme for mobile devices that uses HTML5 technology as mobile interface and iOS and Android smartphones and tablets. 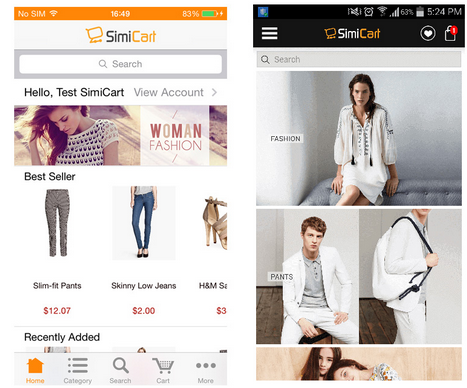 SimiCart is a solution for Magento merchants to build a Magento mobile shopping app for their existing stores. You need to purchase SimiCart to purchase some awesome theme with many helpful features and modern design. Zara is an exclusive edition of SimiCart for Fashion business. Not simply showcase some dresses, pants, shoes or accessories on mobile, it was born to impress your customers at first-sight and intrigue them to buy whatever you’re selling. Even on mobile.